The supersharp radio 'vision' of a continent-wide collection of radio telescopes has answered an outstanding question about the aftermath of a merger of two neutron stars. Aftermath of the merger of two neutron stars. Ejecta from an initial explosion formed a shell around the black hole formed from the merger. A jet of material propelled from a disk surrounding the black hole first interacted with the ejecta material to form a broad "cocoon." Later, the jet broke through to emerge into interstellar space, where its extremely fast motion became apparent. Precise measurement using a continent-wide collection of National Science Foundation (NSF) radio telescopes has revealed that a narrow jet of particles moving at nearly the speed of light broke out into interstellar space after a pair of neutron stars merged in a galaxy 130 million light-years from Earth. The merger, which occurred in August of 2017, sent gravitational waves rippling through space. It was the first event ever to be detected both by gravitational waves and electromagnetic waves, including gamma rays, X-rays, visible light, and radio waves. The aftermath of the merger, called GW170817, was observed by orbiting and ground-based telescopes around the world. Scientists watched as the characteristics of the received waves changed with time, and used the changes as clues to reveal the nature of the phenomena that followed the merger. One question that stood out, even months after the merger, was whether or not the event had produced a narrow, fast-moving jet of material that made its way into interstellar space. That was important, because such jets are required to produce the type of gamma ray bursts that theorists had said should be caused by the merger of neutron-star pairs. The answer came when astronomers used a combination of the NSF's Very Long Baseline Array (VLBA), the Karl G. Jansky Very Large Array (VLA), and the Robert C. Byrd Green Bank Telescope (GBT) and discovered that a region of radio emission from the merger had moved, and the motion was so fast that only a jet could explain its speed. "We measured an apparent motion that is four times faster than light. That illusion, called superluminal motion, results when the jet is pointed nearly toward Earth and the material in the jet is moving close to the speed of light," said Kunal Mooley, of the National Radio Astronomy Observatory (NRAO) and Caltech. The astronomers observed the object 75 days after the merger, then again 230 days after. 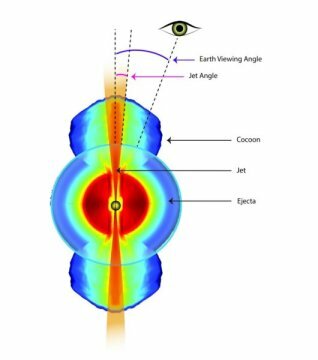 "Based on our analysis, this jet most likely is very narrow, at most 5 degrees wide, and was pointed only 20 degrees away from the Earth's direction," said Adam Deller, of the Swinburne University of Technology and formerly of the NRAO. "But to match our observations, the material in the jet also has to be blasting outwards at over 97 percent of the speed of light." he added. The scenario that emerged is that the initial merger of the two superdense neutron stars caused an explosion that propelled a spherical shell of debris outward. The neutron stars collapsed into a black hole whose powerful gravity began pulling material toward it. That material formed a rapidly-spinning disk that generated a pair of jets moving outward from its poles. As the event unfolded, the question became whether the jets would break out of the shell of debris from the original explosion. Data from observations indicated that a jet had interacted with the debris, forming a broad "cocoon" of material expanding outward. Such a cocoon would expand more slowly than a jet. "Our interpretation is that the cocoon dominated the radio emission until about 60 days after the merger, and at later times the emission was jet dominated," said Ore Gottlieb, of the Tel Aviv University, a leading theorist on the study. "We were lucky to be able to observe this event, because if the jet had been pointed much farther away from Earth, the radio emission would have been too faint for us to detect," said Gregg Hallinan of Caltech. The detection of a fast-moving jet in GW170817 greatly strengthens the connection between neutron star mergers and short-duration gamma-ray bursts, the scientists said. They added that the jets need to be pointed relatively closely toward the Earth for the gamma ray burst to be detected. "Our study demonstrates that combining observations from the VLBA, the VLA and the GBT is a powerful means of studying the jets and physics associated with gravitational wave events," Mooley said. "The merger event was important for a number of reasons, and it continues to surprise astronomers with more information," said Joe Pesce, NSF Program Director for NRAO. "Jets are enigmatic phenomena seen in a number of environments, and now these exquisite observations in the radio part of the electromagnetic spectrum are providing fascinating insight into them, helping us understand how they work." Mooley and his colleagues reported their findings in the September 5 online version of the journal Nature. The National Radio Astronomy Observatory is a facility of the National Science Foundation, operated under cooperative agreement by Associated Universities, Inc.